Yes, that Candy Crush half a billion player base includes you. Don't try to deny it. 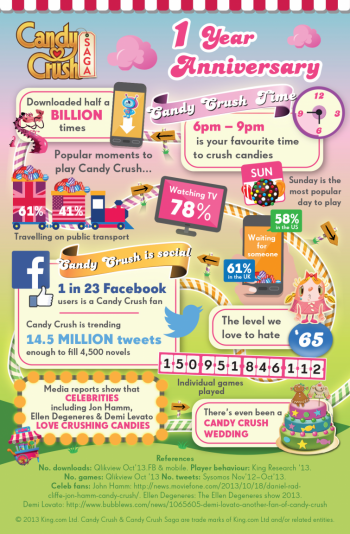 It's been one year since King's Candy Crush Saga came along and crowned itself monarch of the puzzle game realm, and since then over half a billion Facebook and mobile device owners have installed it. Yes, that includes you; don't try to deny it. In fact, if you use Facebook it's impossible to avoid the thing, as 1 in 23 Facebook users have it in their game roster. It's celebrations time over at King, where not even the notorious level 65 - with its firk ding blast chocolate - can dent goodwill. "Fans can look forward to even more exciting new Candy Crush Saga content over the coming months," says King's Tommy Palm, "including an exciting new twist to the game." It's not exactly a game you give your life to, more like something you play when waiting for the commercials to end or travelling on public transport, but over 150 billion individual games have been played so far, with thousands more being added to that total every single day. Now, if you'll excuse me, level 147 has held me back for far too long. Blasted jelly!